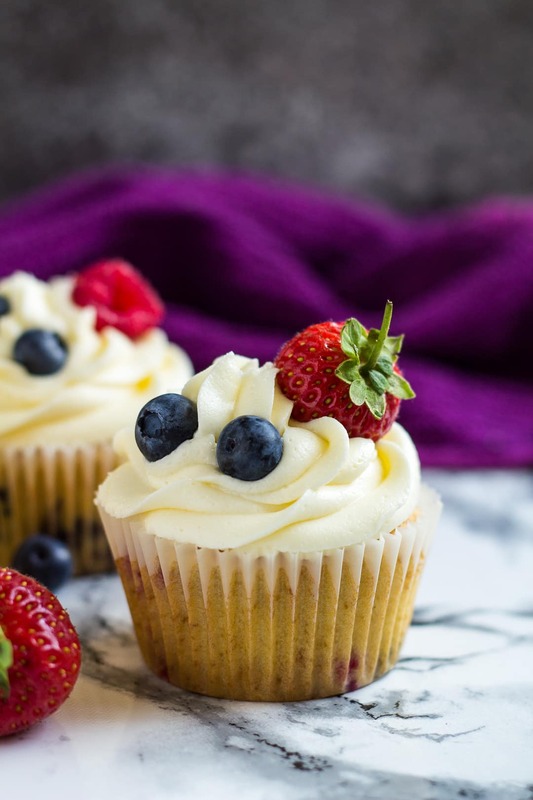 Summer Berry Cupcakes – Deliciously moist and fluffy vanilla cupcakes stuffed with summer berries, and topped with a sweet buttercream frosting! How’s the weather for you? Summer in the UK is literally hot and sunny one day, and pouring it down with rain the next. Buuut nevertheless, I’m still in the mood for baking with all the summer berries. 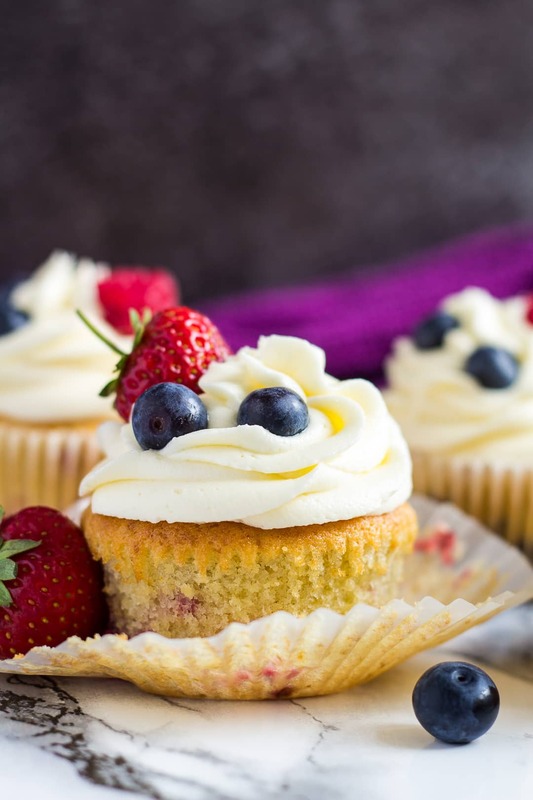 So, today I bring you my Summer Berry Cupcakes! These cupcakes are moist, fluffy, and infused with vanilla. They’re stuffed with three types of summer berries – strawberries, raspberries, and blueberries. 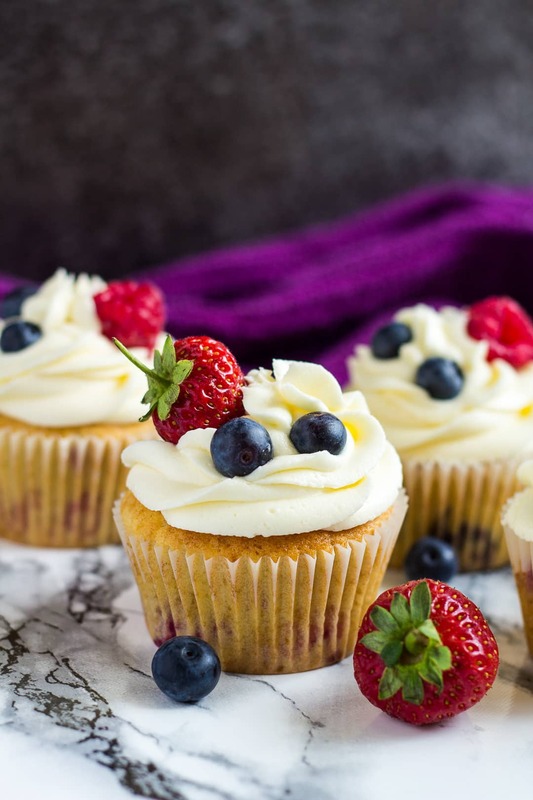 Top these off with a sweet vanilla buttercream frosting, and garnish with even more berries for the perfect summer cupcakes! Cake flour: see my recipe notes below on how to make your own. To make these cupcakes, simply start by whisking together the flour, baking powder, baking soda, and salt. Set aside. In a separate bowl, whisk together the eggs and sugar until combined. Add the vanilla extract, butter, and yogurt, and whisk until combined. Fold in the dry ingredients, then gently fold in the berries. Divide the batter evenly between a muffin pan lined with muffin cases, filling them only 2/3 full. Bake for 15 – 20 minutes, or until a toothpick inserted into the centre comes out clean. Allow to cool for 5 minutes in the pan, before transferring them to a wire rack to cool completely. For the frosting, beat the butter until pale and creamy. Add half of the icing sugar and beat until smooth and combined. Add the rest of the icing sugar and beat until combined. Add the milk and vanilla, and beat until light and fluffy. Add more milk if the frosting is too thick. Transfer the frosting to a piping bag, and frost the cooled cupcakes. Garnish with fresh berries. How long will these Summer cupcakes last? These cupcakes can be stored in an airtight container and kept in the fridge for up to 3 days. Can I freeze these cupcakes? Yes, frosted or unfrosted cupcakes can be frozen for up to 3 months. Thaw overnight in the fridge before serving. 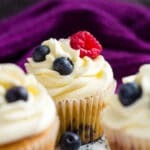 Deliciously moist and fluffy vanilla cupcakes stuffed with summer berries, and topped with a sweet buttercream frosting! Whisk together the eggs. Add the sugar, and whisk until combined. Add the vanilla extract, butter, and yogurt, and whisk until combined. Fold in the dry ingredients, then gently fold in the berries. Using a handheld or stand mixer fitted with the paddle attachment, beat the butter on high until pale and creamy. Add half of the icing sugar and, starting on low speed and working up to high, beat until smooth and combined. Repeat with the remaining icing sugar. Add the milk and vanilla, and beat on high until light and fluffy. Add more milk if too thick, or more icing sugar if too thin. Transfer the frosting to a piping bag, and frost the cooled cupcakes. Garnish with fresh berries! Leftover cupcakes can be stored, in an airtight container, in the fridge for up to 3 days. Frosted or unfrosted cupcakes can be frozen for up to 3 months. Thaw overnight in the fridge. Cupcakes can be made 1 day in advance, covered, and stored at room temperature or in the fridge. Cover the frosting, and store in the fridge until ready to use. These look so simple and elegant! Blueberries and strawberries are always a hit in this house. It’s hot here too in the Boston area of the US. 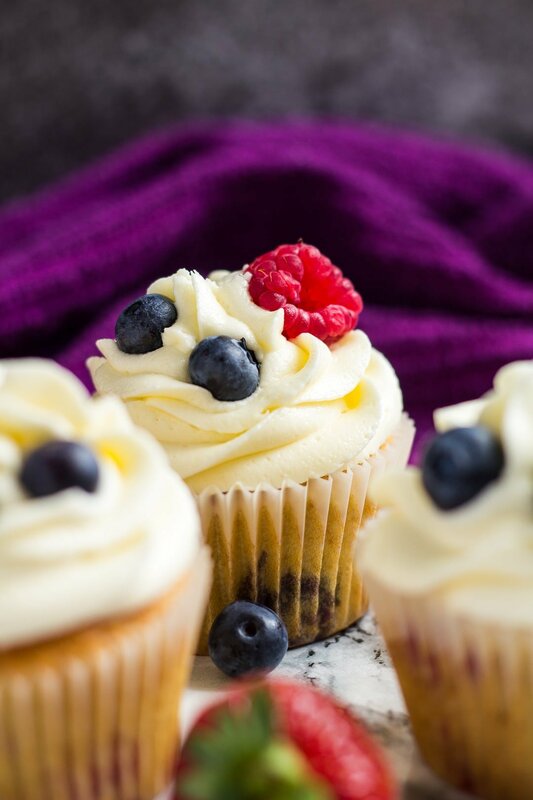 These berry cupcakes look so delicious that I must make them this weekend. Awesome photos! And great recipe! Summer in Canada is the same and this year Toronto has been very unpredictable. But fortunately the berries are doing very well! Gorgeous!!! I can’t get enough of berries this time of year… thanks for another great idea! All those berries sound so wonderful mixed in the cupcake batter. They will be my families favorite.